Cynthia H. Wilbanks as Vice President for Government Relations, directs the University of Michigan's Government Relations programs at the local, state and federal levels. 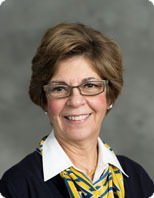 Her responsibilities include planning and developing the institution's response to proposed legislation; developing and maintaining effective relationships with governmental agencies and officials; and analyzing and assessing legislative, administrative and regulatory activities as they pertain to University programs, activities and operations. She also supervises the activities of the State Outreach office. Other University leadership activities include Bentley Historical Library Executive Committee, Bicentennial Planning Committee 2011-12, Ginsberg Center Board, Honorary Degree Committee, Michigan Mobility Transformation Center's Executive Board, Michigan in Washington Program Faculty Advisory Committee, and the Residency Appeals Committee. Cynthia also serves the University as special advisor to the president on the development and growth of the University Research Corridor as well as non-research based external economic development activities. In addition, she has served in several interim roles, as Interim Vice President for Communications in 2007, and as Interim Vice President for Development in 2002-2003. Wilbanks has broad experience in government service as district director for U.S. Congressman Carl D. Pursell from 1979-92, Washtenaw County field representative for Pursell from 1977-79, and staff assistant for U.S. Congressman Marvin Esch from 1973-76. She also was a candidate for U.S. Congress from Michigan's 13th District in 1994. She was president of Michigan's Children, a statewide child advocacy organization in 1993-95, prior to joining the U-M in 1995. She is a member of a number of community and civic organizations, including serving on the boards of directors of the American Center for Mobility, Bank of Ann Arbor, Center for Michigan, Ann Arbor SPARK where she is currently serving as Chair, and Riverside Arts Center Foundation. She has previously served in leadership roles of the Ann Arbor Hands-On Museum Board of Directors and Glacier Hills Retirement Center Board. Past board service includes NEW (Non-Profit Enterprise at Work) and the Junior League Community Advisory Committee. Governor Engler appointed her to serve on the Michigan Higher Education Assistance Authority with a term expiring in May 2008. She also served three consecutive years as the University of Michigan United Way Campaign Chair and is currently serving as the Co-Chair for the Campaign. In March 2017, Wilbanks was the recipient of the United Way of Washtenaw County "Woman of the Year" award and in April 2016, she received the "Robert E. Guenzel" Award. In 2002, she was named one of the 100 most influential women in Metro Detroit by Crain's Detroit Business and was recipient of the Spirit Award for outstanding community service in Washtenaw County from Spectrum Prevention Services. In May 2002, she received the Women of Distinction Award from the Girl Scouts of the Huron Valley Council. Wilbanks was named an Outstanding Young Woman of America in 1981 and also received the Director's Award for Outstanding Service from the Michigan Technology Council. Prior to her appointment to vice president in September 1998, Wilbanks served as associate vice president for University Relations where she was responsible for state government relations. Wilbanks earned a B.A. in Political Science and a Secondary Teaching Certificate from the University of Michigan.